At some point in our lives, sadly, we all have to deal with loss. Individuals suffer emotionally when something or someone they love is taken away. In most cases, grief is the resulting emotion. Grief is a natural, multifaceted response to loss that includes emotional, physical, cognitive, behavioral, social, spiritual, and philosophical dimensions. 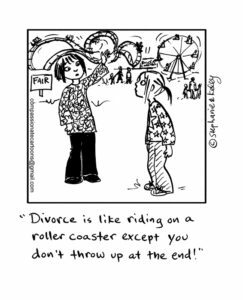 But has anyone ever really thought about how that relates to divorce? Divorce involves a unique aspect of rejection and loss. As many of us know, not all divorces are amicable and not all are mutual. However, even then, there is still an aspect of rejection and loss when separating from one you once loved. In divorce proceedings, there is usually ongoing contact with the other spouse, particularly if there are children involved. This ongoing, but necessary, contact can, of course, be very difficult. In turn, it can affect the quality of a grieving spouse’s co-parenting skills. Many mental health experts agree that there are five stages of grief experienced by any person who has suffered a loss, including, but not limited to, a divorce. The five stages are: denial, anger, bargaining, depression, and finally acceptance. Many times we think to ourselves that these must be experienced in a certain order, however, they can be experienced in any order. Even more than not experiencing these in order, not all people experience all five stages. Some people will revisit one or more stages many times in their individual grief resolution process, some will not, it just depends on each individual, and nobody’s experience is exactly the same. Each stage of grief can provide both positives and negatives in the divorce process, depending on each person’s capacity to move through each of the grief stages experienced. Sometimes it can feel like a roller-coaster of emotional upheavals and not a linear process. Take a deep breath and acknowledge if you are experiencing grief. Keeping active, seeking support groups or advice from a licensed professional are options to explore based on your situation. If you are a parent or care-giver, taking care of yourself is important.